The Vega was an early attempt by General Motors to break into the fuel-efficient compact car market. Unfortunately, the Vega quickly earned a reputation for consuming, not gasoline, but motor oil. 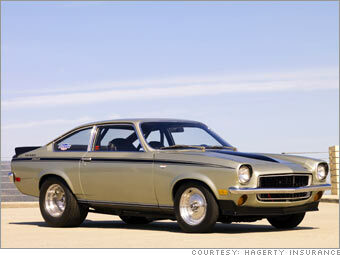 The Vega's aluminum engine just wasn't up to the job and, according to various sources, the cars were plagued by mechanical problems, including a hearty appetite for lubricants. Premature rusting was another commonly reported issue. If true, it was probably a bad sign when, eight miles into a test run on GM's proving track, a Vega literally fell apart, as related in a book by John DeLorean recalling his days as head of Chevrolet. GM produced about 3,500 (relatively) high-performance Cosworth Vegas which are (relatively) collectible today. "They sell for more than you'd think," said McKeel Hagerty, president of Hagerty Insurance, which conducted the survey.